Canada and the United States share a long border, and within that the Nooksack Fraser Transboundary (NFT) area shares surface and ground waters that collectively drain to Bellingham Bay. 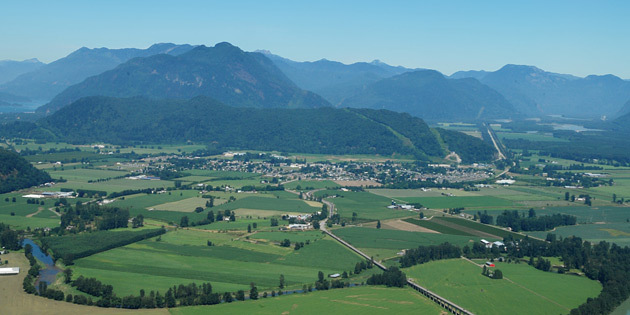 The Nooksack-Fraser Transboundary area is home to communities with a strong base in farming, fisheries and outdoor recreation (shown above). Water quality issues impact parts of this area, where sewage effluent and animal waste appear to be important sources of nitrogen (N) and phosphorus (P) in the environment. Nitrogen loading is causing eutrophication in coastal areas. Prolonged nitrate contamination of groundwater has been present over a large area. A nitrogen assessment is quantifying the sources and fate of N in the watershed using high-resolution modeling of atmospheric deposition, transportation sources, synthetic fertilizer application rates, food and feed imports, manure disposal, wastewater treatment plants, and native nitrogen-fixing trees (alder) (some of these flows are shown in the figure below). Extensive long-term records of groundwater, surface water, and estuarine water quality and land use change over time provide validation data sets. This project brings together stakeholders, agencies, and scientists on both sides of the international border with Native American Tribes to achieve a first characterization of N inventories and fluxes across the transboundary watershed. The communities of the NFT are ready to collaborate to find solutions that identify voluntary approaches to reduce N pollution effects to fisheries, water quality, and human health while maintaining economic and social vitality. To that end we will quantify and understand nutrient budgets for the region; identify, compare, and map the policy space in the US and Canada that either supports or interferes with implementing best management practices to reduce N loss. This local project integrates nutrient budgets with policy studies to identify opportunities or barriers for improved nutrient management in the region. For more information on the Nooksack-Abbotsford-Sumas Transboundary Study please find our 'project information leaflet' below.